Eric Stein is the chief revenue officer of Branch.io. We’re on the verge of another digital revolution. I’ve seen it before, when I was at DoubleClick in 1997, and I’m seeing it now as mobile begins to take over the hearts and minds of marketers, advertisers and corporations. At DoubleClick, I helped start our international operations and targeted large brands to convince them of the benefits of internet advertising — “the most targetable media ever.” It was a tough job: The idea was novel and a little ahead of the market at that time. (To put it into context, the first banner ad was only sold on October 27, 1994.) I still remember the CMO of a Fortune 500 tech company didn’t even have email on her desktop in 1998. But the attention of consumers was quickly shifting to the internet, and the media spend had to follow. We used to tell ourselves that when the Top 10 online advertisers mirrored the list of the Top 10 advertisers in any given country, we would have arrived. Enter the dot-com boom. Many of these new companies had huge budgets, asked very few questions and were just throwing marketing dollars at user acquisition in whichever channel they thought might make sense — with web ads being the most popular. Driven by the spending frenzy from those companies, revenues from internet advertising soared to an astounding $4.62 billion by the end of 1999. However, the fundamentals underpinning the ROI of this spend were not really there (yet). The required level of customer acquisition was not attained; not enough customers were retained to sustain the level of expenditure. And the sole reliance on one single channel for user acquisition was never sustainable. Remember Kozmo.com? There were many more. By the summer of 2001, the dot-com bubble had burst and DoubleClick was no longer in the media business (and a lot worse would happen in September). 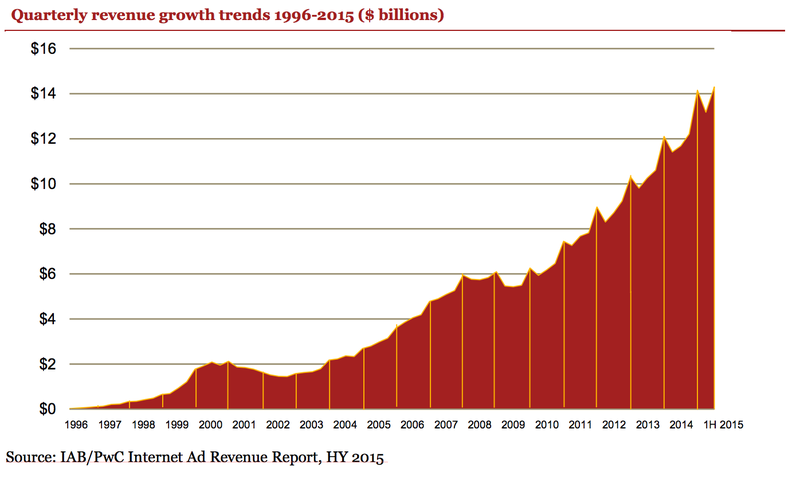 From its peak in 2000, online advertising would not recover until 2004. Of course, those who secretly desired for this new media to disappear would be sorely disappointed. The internet “scaled,” penetration and bandwidth increased, download speeds and the cost of technology plummeted and the internet morphed into what we have today. Consumer attention continued to shift to digital formats and the internet media in its entirety has taken the largest market share (33 percent) in advertising. 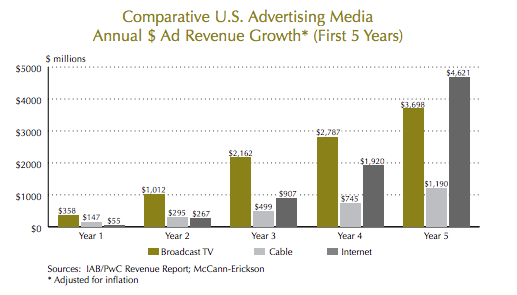 Advertising market growth picked up again in 2009, and this time mobile is fueling the new wave of ad-dollar spend. 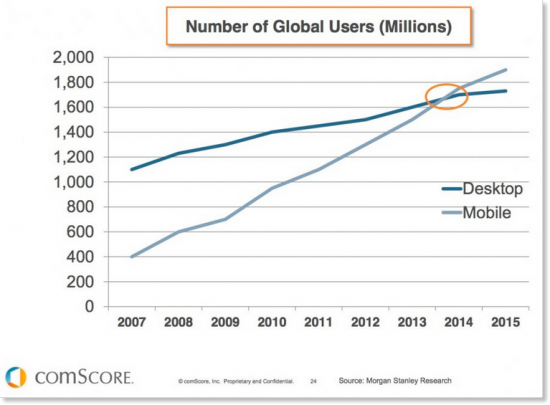 Apple launched the App Store in June 2008, and mobile as we know it today started to take off. Consumers spend an increasing percentage of their time on mobile devices, and mobile device users have surpassed desktop users for media and website consumption. 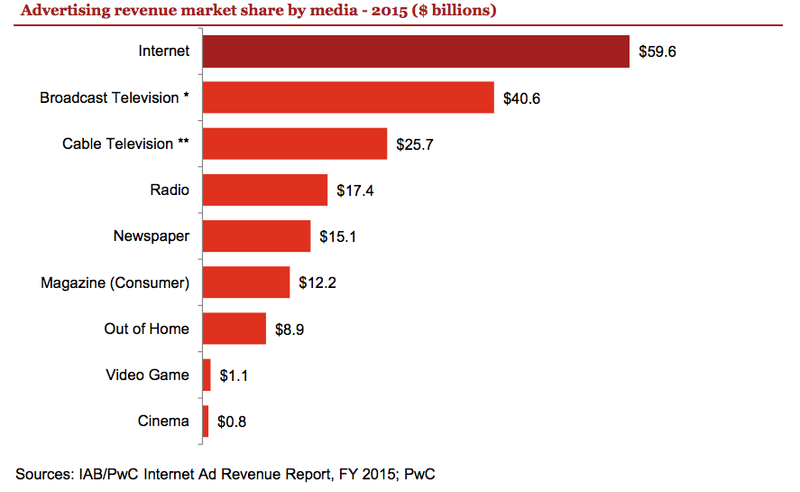 Similarly, mobile advertising spending now represents the largest share of total ad revenues. 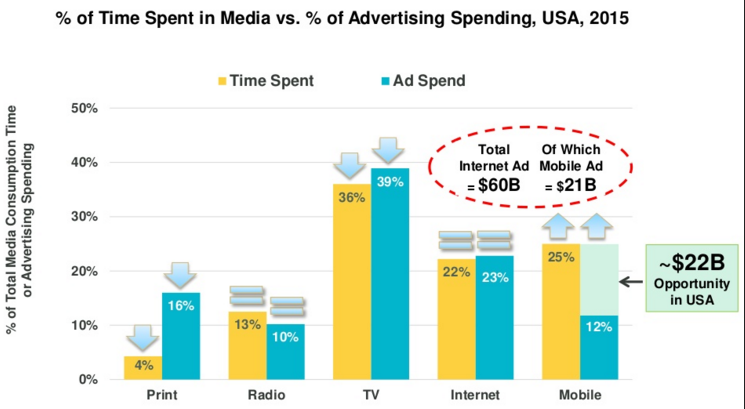 Furthermore, the discrepancy between mobile consumption and mobile ad dollars, a metric Mary Meeker has tracked since the early days of internet advertising, has positioned the market for further and faster growth in the coming years. To paraphrase Mark Twain, could the history of early internet advertising be rhyming in 2016? 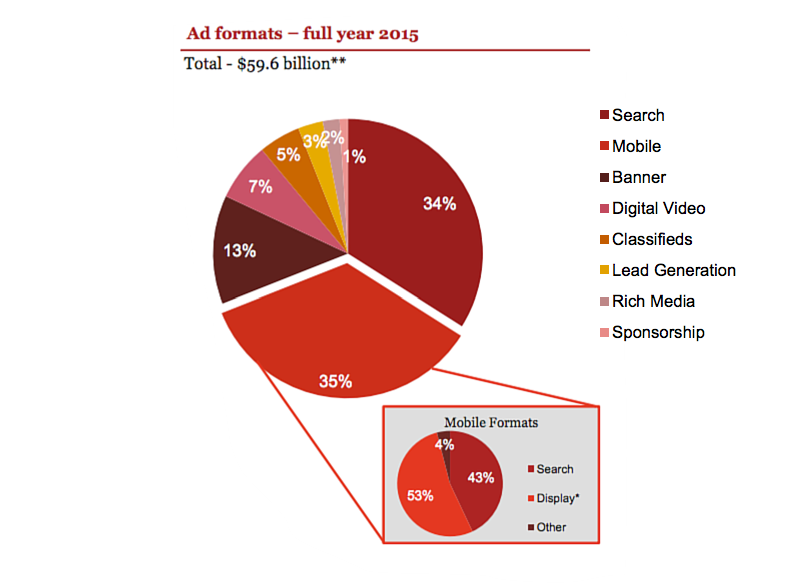 Companies that focused on mobile early have built huge businesses serving these advertisers. Take Facebook for example. Mobile ad revenues represented approximately 82 percent of all advertising revenue for Facebook in Q1 2016, up 73 percent YoY. And app install ads already were accounting for more than half of its mobile revenue in 2015 — and the percentage can only go up. And again, the business fundamentals for traditional marketing are not there. What do I mean by fundamentals? It’s a mix of customer acquisition, retention and engagement. Marketers are paying anywhere from $2-$4 for every app install and, yet, only 10 percent of those new users are using the app a week after downloading it. That means brands will need to make $30 per acquired user in 7 days. There are not many businesses that can sustain customer acquisition costs of that nature. At the same time, the growth of mobile and evidence that the app is a much preferred user experience is leading to increased focus on the part of traditional marketers who realize that they need to use this channel to fully engage today’s consumer. Consumers engage at higher rates — at every step of the funnel — in a mobile app than they do on the mobile web (and even better than desktop), and convert at anywhere from 100 percent to 300 percent better than mobile web. Furthermore, according to a comScore study, app users spend more than three hours per month on the top 1,000 apps, which is 18x greater than what mobile web visitors spend on the top 1,000 web properties. The early money in mobile app advertising was spent by companies that had few other options when it comes to app marketing. When you are an app-only or app-heavy company, app install ads are the only quick and easy way to acquire new users. In fact, those are the types of companies that make up most of the highest spenders on these types of ads. As more traditional marketers recognize the opportunity in engaging their consumers through apps, they won’t be as single-channel dependent. They will start to diversify their strategy and continue to acquire new customers in various channels and focus on converting their existing customers into new app users (and more engaged customers) through those traditional channels. Looking for ways to seamlessly integrate their apps into their other marketing channels will be increasingly important, and they’ll be able to grow their mobile business without spending the exorbitant prices that many of the early adopters have needed to. Don’t look for me to be shorting Facebook or Google (I own both); they have too strong a business and amazing growth opportunities in new initiatives. But I do think their reliance on app install ads is disproportionate, and it will recalibrate as the market moves toward the Top 10 mobile advertisers matching the Top 10 advertisers overall. Just like what happened with internet advertising in the early aughts.